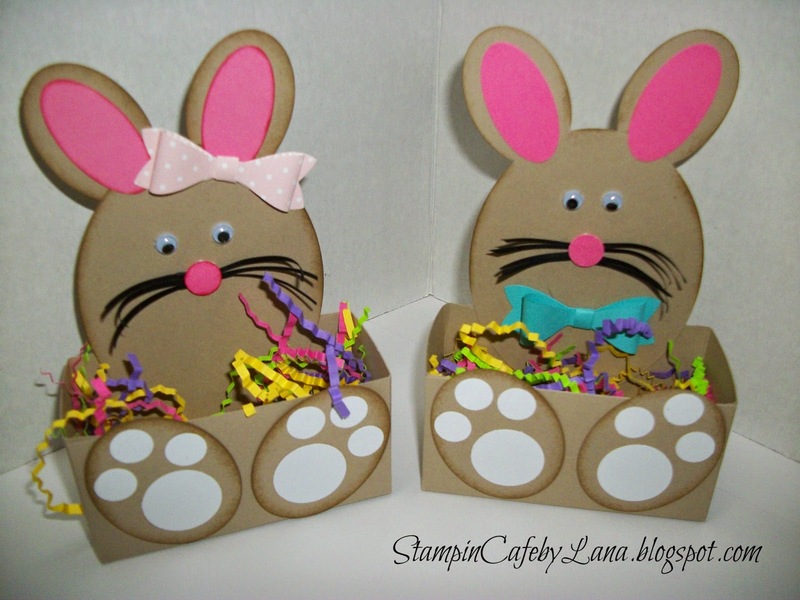 Mary from Cardz TV did a video where she made a bunny basket using the Silhouette. I don't have a Silhouette so I decided to try to make it on my own. These are my results! You need to use a heavy weight cardstock so the basket will be sturdy enough to hold candy. I used crumb cake cardstock from Stampin' Up! 1. Cut a piece of cardstock measuring 6 x 8 inches, scoring 2 inches on all sides. On both long sides, cut up on the vertical score lines to the horizontal score lines. Trim a small wedge out of each corner as shown in the picture. This will help the box close properly. 2. Fold the tabs in on all sides to form the box and adhere with Scor-Tape or glue. 3. Using a large oval die, cut the body of the bunny. I used Sissix 3.4 x 4.2 inch die. Adhere to inside of box on the back. 4. Using the middle sized die cut out the feet. Using a 1 inch punch, punch out the pads of the paws and then use a 1/2 inch punch to punch out the toes. Attach to front of box. 5. For the ears, I used the extra large oval punch and the medium oval punch (pink layer) from Stampin' Up! Attach to body of bunny. 6. Punch out a 1/2 inch circle or heart for the nose and add whiskers. I used fringe scissors to cut out the whiskers and glued them behind the nose. 7. Add googly eyes or punched out circles of your choice. 8. I used the Stampin' Up! bow builder punch for the bows. I hope you enjoy making these baskets as much as I did. I love a challenge! I welcome any comments or questions you have.